I have chosen to design a poster for a James Blake show coming up really soon. I'm pretty excited about the show and will be going myself. Blake's music is considered post dubstep mixed with soul and the blues. He creates his music on his computer and with pianos and keyboards. In the end, it just boils down to a man who is doing things in music that no one else is doing. To me, he is an explorer going into uncharted territories. Haunting as that may sound, it's also refreshing to hear. Please let me know what color scheme you guys like. I think I know what one I am leaning towards, but it's hard to decide. As far as working on my poster, todays class helped a lot. I mainly went through my illustrator file and got rid of any color that wasn't one of my primary 3. Lastly, I added small details and perfected some clunky things that I thought were not working. I feel as a whole, the poster can use a bit more work... but let's see how much time I can afford come tomorrow. It's getting so close though. I'm looking forward to screen printing this one in my garage this weekend. Here is another small update. I am sticking with my typeface on the helmet. I know I wasn't sure about it for a bit, but now I am. Also I am starting to seperate my colors and add texture. I want to start doing this because I will be screen printing my poster. I'll do a bigger update later this week before they are due. then I hope to be printing them this weekend. Also, I'll be showing them to James Blake's management team and seeing if they want to sell them at the show next month. Here is another update. As you can see I have been playing around with the type and trying to make it work into the illustration a bit more. Your guys' comments on that have been super helpful. Aside from that, I focused on bringing in more detail to the keyboard and the astronaut as a whole. Adter I finish a bit more on him I will be moving on to textures and adding in some background stuff. Today I went into Illustrator for the first time. I took my sketch from below and started preparing the big shapes and text. It all still has a long way to go. I feel that in my next time around it will really start bringing itself together. I will start putting in the details and of the suite and making sure that the keyboard and the text fit in well with the rest of the illustration. For color, I am playing with a few ideas. At first I wanted a dark feel to it, but now I am digging the light colored feel. I still want there to be stars and what not in the background but I think it cold be cool to be a light colored space. What do you guys think? Ok guys, I finally got a moment to sit down after valentines day and garage cleaning to sketch this out. I took what I liked from my previous sketchbook drawings and composited them together in photoshop. Then I just started drawing over the top of it and ironing out the details even more. For the astronaut I quickly drew over him and added the correct lighting and wrinkles in the suit. I even added some buttons and knobs to the helmet to give it more detail. I like looking at the fine details in posters sometimes and I think it would be cool to see these in some sort of haltone or something like that. For the keyboard I actully researched what style Blake used and found an image of it to illustrate. After This I added a super quick gradient to get a feel for the tone of the piece. This is far from final but it's the first step to adding color and values. The next step is to actually take everything into Illustrator and go from there. Now comes the fun part! For this round of sketches I really wanted to get down and figure out as much as I could about my designs. That means that I wanted to get to the nitty gritty of what the elements were going to look like. Everything from type face to small details in the drawings were added. All in all it's going pretty well I think. So as you can see from below, I went with the astronaut/ space suite helmet that some of you guys seemed to like (it was also my favorite). When drawing the sketches I really tried to vary my poster layouts to focus on different things. One has a focus on illustration and texture, while another has a focus on hand made type. This helped me really hone in on what it was I wanted to say about Blake and his music. Doing this also helped me find out what worked and what didn't. Here they are all lined up together. What one do you guys like. I'm leaning toward # 2 or 4. Those I think are the strongest in a design and composition sense. This one here is more of a focus on type. The illustration is going to be pretty simple but yet illustrative. Here I waned the space helmet to be a secondary object. The character is also in space, so surrounding him will the the starts and galaxies. There might even be a satellite or two floating around him. This one the text is really simple and almost hidden. The illustration takes front and center here. I don't like how this sketch came out so much. The thumbnail of it was great, but the bigger version just fell flat for me. This sketch is a combination of text and illustration that is center stage. I think if I did this one I would probaby put a man in the helmet so as to represent James Blake. For some reason I drew a girl in it while I was sketching. oops. This one is a failed attempt at making a huge meteor in the center of the image. It was too literal to me also. My thoughts started out pretty generic, as always. I had to get all my bad ideas out of me though. I wanted to include the city of San Francisco into the designs because that's where the show would be taking place. I did a couple thumbnails based around cityscapes, fog, and even sail boats. LAME. 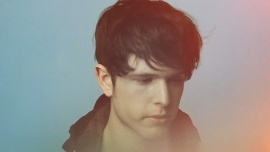 What the hell do sail boats have to do with James Blake? So I reeled it in a bit more. James Blake's music is pretty sad, dark, and dramatic. When I thought of things that made me sad, I started thinking about the end of the world. Meteors and asteroids colliding with San Francisco or Earth. Now I was getting somewhere. It still wasn't right though. It was a personal interpretation of his music. I think in order for posters to be great, they must hit a chord with the audience. Yes, people can relate to thinking of the end of the world, but when they see the end of the world in their head, do they think of James Blake? Probably not. To me, my poster design has to relay my thoughts AND the audience's. That's where the center page below came in. I started thinking of an astronaut and an invisible man. An astronaut is an explorer. They are peple who go to the farthest reaches of space to go to new places or discover things unknown. That is what I think James Blake does for music. He is going to places that no one else has. Uncharted musical territory. So I think that is what I will elaborate on tomorrow. What do you guys think? These are the pages of thumnails that I did. This is the one that I will elaborate one. The astronaut is simplified to a man just wearing a helmet. It might change to a full suit or it might not. But What I want to say is that he is going places that people only dream of. No one is like him. In the sketches above you can also see that there is an asteroid coming straight for him in the reflection of his helmet. I liked this becasue it gave not to the end of the world theme that I mentioned above. first page of sketches. An in progress photo. Second page of sketches. An in progress photo. Third page of sketches. An in progress photo. I love the Low poly feel here. Not sure if I will end up using any of this, but I want to explore it. I really like the way the fog looks here. I also want to play with fog in my design. One thing I am not sure about is how I will make a fog "look" that I want, within the range of screen printing. I will probably have to do some sort of halftone or texture. What do you guys think? I also love the fog and colors here. I think i defiitely want my colors to be cool (as opposed to a warm feel). Again, lovely colors, lovely fog. Damn..this is just gorgeous. I would like to play with type in my poster as well. I want it to be simple but not just an out the box font. Whatever it is, it must also fit the theme of the poster, whatever it may be. Simple type with a great color pattern. What I love here is how simple the designs are, but how effective they are at communicating overlapping layers and light and shadow.